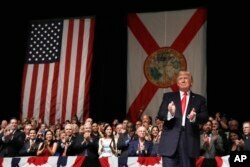 The Trump administration will defend America's decades-old economic embargo on Cuba in a United Nations vote this week, the State Department said Tuesday, in a reversal from the Obama administration that reflects deteriorating U.S.-Cuban relations. A "no" vote Wednesday from U.S. Ambassador to the U.N. Nikki Haley will return the United States to a place of extreme isolation within the global community over its policy toward Cuba, potentially undermining the Trump administration's broader goals for engagement with Latin America. The U.S. embargo on Cuba is almost universally opposed throughout the world. "For far too long, Cuba has engaged in human rights abuses — human rights abuses that perhaps past administrations have turned and looked the other way," Nauert said. Still, she said the U.S. would continue pursuing engagement with the island that advances American interests. FILE - President Donald Trump arrives in Miami to speak about Cuba policy, June 16, 2017. "Reflexive and baseless, and a regrettable mistake," said Sen. Patrick Leahy, D-Vt., a prominent voice on U.S.-Cuba relations, after the planned "no" vote was announced. General Assembly resolutions are nonbinding and unenforceable. But the annual exercise has given Cuba a global stage to demonstrate how little support America's commercial, economic and financial embargo enjoys. The yearly vote condemning the U.S. embargo has reliably passed overwhelmingly. Voting "no" means the U.S. will once again be pitted against almost every other nation. In 2015, the last year that the U.S. voted "no," close ally Israel was the only country to join in opposition, leading to a 191-2 vote to condemn the embargo — the highest number of votes ever for the measure. The United States lost its only other ally in the vote, Palau, in 2013, when the Pacific island nation abstained rather than joining the U.S. in voting "no." "To Cuba, it is unacceptable and immoral that the U.S. government has decided to take political decisions that harm the Cuban people," he said. At least 24 U.S. government workers and their spouses are "medically confirmed" to have been affected by the unexplained attacks in Havana, the State Department has said. The victims suffered a range of medical conditions including permanent hearing loss and mild traumatic brain injury, known as concussion. Cuba vehemently denies any knowledge of involvement. The U.S. has not blamed Cuba for perpetrating the attacks and says it doesn't know who is responsible, but has nonetheless faulted Castro's government for failing to keep American diplomats safe in his country. The Cuban Embassy in Washington did not immediately respond to a request for comment on the planned U.S. "no" vote. 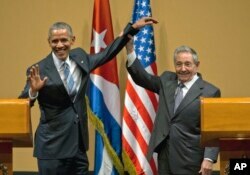 FILE - Cuban President Raul Castro, right, lifts up the arm of President Barack Obama at the conclusion of their joint news conference at the Palace of the Revolution, in Havana, Cuba, March 21, 2016. In late 2014, Obama and Castro announced plans to restore relations, and the following year embassies were re-opened in Washington and Havana more than half a century after ties were cut in 1961. Although the Obama administration eased travel and commerce restrictions on Cuba, allowing direct commercial flights between the countries to resume, Obama was unable to persuade Congress to repeal the formal embargo. The Republican-led Congress has continued to support the far-reaching sanctions. The Obama administration's decision last year to abstain rather than vote "no" was cheered in the 193-member General Assembly. Samantha Power, the U.S. ambassador to the U.N. at the time, said the United States remained opposed to some of the Cuban government's practices and policies but was pursuing a new approach to engagement with the island.